On the full moon day of May, in the year 623 B.C., there was born in the district of Nepal an Indian Sakya Prince named Siddhattha Gotama, who was destined to be the greatest religious teacher in the world. Brought up in the lap of luxury, receiving an education befitting a prince, he married and had a son. One happy morning, while He was deeply absorbed in meditation, unaided and unguided by any supernatural power and solely relying on His efforts and wisdom, He eradicated all defilements, purified Himself, and, realizing things as they truly are, attained Enlightenment (Buddhahood) at the age of 35. He was not born a Buddha,1 but He became a Buddha by His own striving. As the perfect embodiment of all the virtues He preached, endowed with deep wisdom commensurate with His boundless compassion. He devoted the remainder of His precious life to serve humanity both by example and precept, dominated by no personal motive whatever. The Buddha is neither an incarnation of the Hindu God Vishnu, as is believed by some, nor is He a savior who freely saves others by His personal salvation. The Buddha exhorts His disciples to depend on themselves for their deliverance, for both purity and defilement depend on oneself. Clarifying His relationship with His followers and emphasizing the importance of self-reliance and individual striving, the Buddha plainly states: "You should exert yourselves, the Tathagatas2 are only teachers." He comforted the bereaved by His consoling words. He ministered to the sick that were deserted. He helped the poor that were neglected. He ennobled the lives of the deluded, purified the corrupted lives of criminals. He encouraged the feeble, united the divided, enlightened the ignorant, clarified the mystic, guided the benighted, elevated the base, dignified the noble. Both rich and poor, saints and criminals loved Him alike. Despotic and righteous kings, famous and obscure princes and nobles, generous and stingy millionaires, haughty and humble scholars, destitute paupers, down-trodden scavengers, wicked murderers, despised courtesans — all benefited by His words of wisdom and compassion. His iron will, profound wisdom, universal love, boundless compassion, selfless service, historic renunciation, perfect purity, magnetic personality, exemplary methods employed to propagate the Teachings, and his final success — all these factors have compelled about one-fifth of the population of the world today to hail the Buddha as their supreme Teacher. In The Three Greatest Men in History H.G. Wells writes: "In the Buddha you see clearly a man, simple, devout, lonely, battling for light — a vivid human personality, not a myth. He too gave a message to mankind universal in character. Many of our best modern ideas are in closest harmony with it. All the miseries and discontents are due, he taught, to selfishness. Before a man can become serene he must cease to live for his senses or himself. Then he merges into a great being. Buddha in different language called men to self-forgetfulness 500 years before Christ. In some ways he is nearer to us and our needs. He was more lucid upon our individual importance and service than Christ and less ambiguous upon the question of personal immortality." Fausboll says — "The more I know of Him, the more I love Him." A humble follower of his would say — "The more I know Him, the more I love Him; the more I love Him, the more I know Him." Immediately after His demise 500 chief Arahats3 versed in the Dhamma4 and Vinaya,5 held a convocation to rehearse the Doctrine as was originally taught by the Buddha. Venerable Ananda Thera, who enjoyed the special privilege of hearing all the discourses, recited the Dhamma, while the Venerable Upali recited the Vinaya. The Vinaya Pitaka which is regarded as the sheet anchor to the oldest historic celibate order — the Sangha — mainly deals with rules and regulations which the Buddha promulgated, as occasion arose, for the future discipline of the Order of monks (Bhikkhus) and nuns (Bhikkunis). It described in detail the gradual development of the Sasana (Dispensation). An account of the life and ministry of the Buddha is also given. Indirectly it reveals some important and interesting information about ancient history, Indian customs, arts, science, etc. Digha Nikaya (Collection of Long Discourses). Majjhima Nikaya (Collection of Middle-Length Discourses). Samyutta Nikaya (Collection of Kindred Sayings). Anguttara Nikaya (Collection of Discourses arranged in accordance with numbers). "Do not accept anything on (mere) hearsay — (i.e., thinking that thus have we heard it from a long time). Do not accept anything by mere tradition — (i.e., thinking that it has thus been handed down through many generations). Do not accept anything on account of mere rumors — (i.e., by believing what others say without any investigation). Do not accept anything just because it accords with your scriptures. Do not accept anything by mere suppositions. Do not accept anything by mere inference. Do not accept anything by merely considering the reasons. Do not accept anything merely because it agrees with your pre-conceived notions. Do not accept anything merely because it seems acceptable — (i.e., thinking that as the speaker seems to be a good person his words should be accepted). Do not accept anything thinking that the ascetic is respected by us (therefore it is right to accept his word). "But when you know for yourselves — these things are immoral, these things are blameworthy, these things are censured by the wise, these things, when performed and undertaken conduce to ruin and sorrow — then indeed do you reject them. "When you know for yourselves — these things are moral, these things are blameless, these things are praised by the wise, these things, when performed and undertaken, conduce to well-being and happiness — then do you live acting accordingly." For our own good, and out of gratitude, we pay such external respect but what the Buddha expects from His disciple is not so much obeisance as the actual observance of His Teachings. The Buddha says — "He honors me best who practices my teaching best." "He who sees the Dhamma sees me." With regard to images, however, Count Kevserling remarks — "I see nothing more grand in this world than the image of the Buddha. It is an absolutely perfect embodiment of spirituality in the visible domain." If, by religion, is meant "a teaching which takes a view of life that is more than superficial, a teaching which looks into life and not merely at it, a teaching which furnishes men with a guide to conduct that is in accord with this its in-look, a teaching which enables those who give it heed to face life with fortitude and death with serenity,"6 or a system to get rid of the ills of life, then it is certainly a religion of religions. In observing the principles of morality a Buddhist should not only regard his own self but also should have a consideration for others we well — animals not excluded. Morality in Buddhism is not founded on any doubtful revelation nor is it the ingenious invention of an exceptional mind, but it is a rational and practical code based on verifiable facts and individual experience. The foundations of Buddhism are the four Noble Truths — namely, Suffering (the raison d'etre of Buddhism), its cause (i.e., Craving), its end (i.e., Nibbana, the Summum Bonum of Buddhism), and the Middle Way. 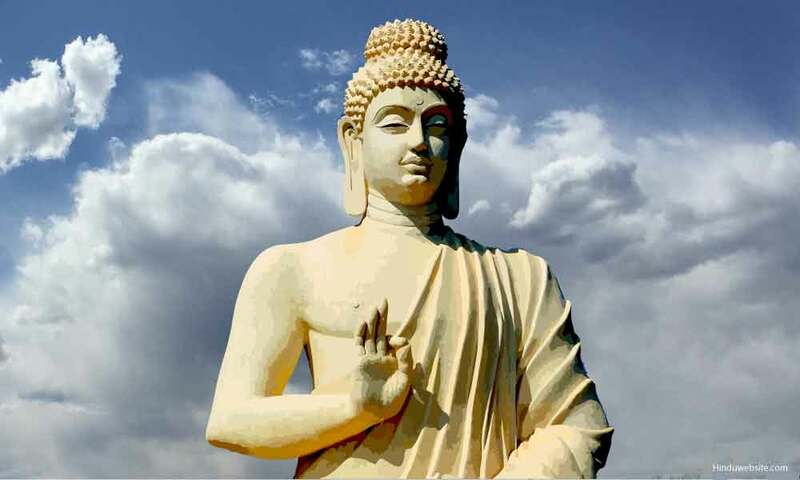 The Buddha was so tolerant that He did not even exercise His power to give commandments to His lay followers. Instead of using the imperative, He said: "It behooves you to do this — It behooves you not to do this." He commands not but does exhort. A woman child, O Lord of men; may prove Even a better offspring than a male. Many women, who otherwise would have fallen into oblivion, distinguished themselves in various ways, and gained their emancipation by following the Dhamma and entering the Order. In this new Order, which later proved to be a great blessing to many women, queens, princesses, daughters of noble families, widows, bereaved mothers, destitute women, pitiable courtesans — all, despite their caste or rank, met on a common platform, enjoyed perfect consolation and peace, and breathed that free atmosphere which is denied to those cloistered in cottages and palatial mansions. It was also the Buddha who banned the sacrifice of poor beasts and admonished His followers to extend their loving kindness (Metta) to all living beings — even to the tiniest creature that crawls at one's feet. No man has the power or the right to destroy the life of another as life is precious to all. These are some of the salient features of Buddhism, and amongst some of the fundamental doctrines may be said — Kamma or the Law of Moral Causation, the Doctrine of Rebirth, Anatta and Nibbana. On one occasion9 a certain young man named Subha approached the Buddha, and questioned why and wherefore it was that among human beings there are the low and high states. Kamma Niyama, order of act and result, e.g., desirable and undesirable acts produce corresponding good and bad results. Utu Niyama, physical (inorganic) order, e.g., seasonal phenomena of winds and rains. Bija Niyama, order of germs or seeds (physical organic order); e.g., rice produced from rice-seed, sugary taste from sugar cane or honey etc. The scientific theory of cells and genes and the physical similarity of twins may be ascribed to this order. Citta Niyama, order of mind or psychic law, e.g., processes of consciousness (Citta vithi), power of mind etc. Dhamma Niyama, order of the norm, e.g., the natural phenomena occurring at the advent of a Bodhisatta in his last birth, gravitation, etc. If we postulate a past, present, and a future life, then we are at once faced with the alleged mysterious problem — "What is the ultimate origin of life?" For a being to be born here a being must die somewhere. The birth of a being, which strictly means the arising of the five aggregates or psycho-physical phenomena in this present life, corresponds to the death of a being in a past life; just as, in conventional terms, the rising of the sun in one place means the setting of the sun in another place. This enigmatic statement may be better understood by imagining life as a wave and not as a straight line. Birth and death are only two phases of the same process. Birth precedes death, and death, on the other hand, precedes birth. The constant succession of birth and death in connection with each individual life flux constitutes what is technically known as Samsara — recurrent wandering. Paticca means because of, or dependent upon: Samuppada "arising or origination." Paticca Samuppada, therefore, literally means — "Dependent Arising" or "Dependent Origination." Dependent on ignorance of the Four Noble Truths arise activities (Sankhara) — both moral and immoral. The activities whether good or bad rooted in ignorance which must necessarily have their due effects, only tend to prolong life's wandering. Nevertheless, good actions are essential to get rid of the ills of life. These five — viz., consciousness, mind and matter, six senses, contact and feeling — are the effects of past actions and are called the passive side of life. "There are some philosophers," he says, "who imagine we are every moment conscious of what we call 'ourself,' that we feel its existence and its continuance in existence and so we are certain, both of its perfect identity and simplicity. For my part, when I enter most intimately into what I call 'myself' I always stumble on some particular perception or other — of heat or cold, light or shade, love or hatred, pain or pleasure. I never catch myself... and never can observe anything but the perception... nor do I conceive what is further requisite to make me a perfect non-entity." Dealing with this question of soul Prof. James says — "The soul-theory is a complete superfluity, so far as accounting for the actually verified facts of conscious experience goes. So far no one can be compelled to subscribe to it for definite scientific reasons." In concluding his interesting chapter on the soul he says: "And in this book the provisional solution which we have reached must be the final word: the thoughts themselves are the thinkers." According to Buddhism mind is nothing but a complex compound of fleeting mental states. One unit of consciousness consists of three phases — arising or genesis (uppada) static or development (thiti), and cessation or dissolution (bhanga). Immediately after the cessation stage of a thought moment there occurs the genesis stage of the subsequent thought-moment. Each momentary consciousness of this ever-changing life-process, on passing away, transmits its whole energy, all the indelibly recorded impressions to its successor. Every fresh consciousness consists of the potentialities of its predecessors together with something more. There is therefore, a continuous flow of consciousness like a stream without any interruption. The subsequent thought moment is neither absolutely the same as its predecessor — since that which goes to make it up is not identical — nor entirely another — being the same continuity of Kamma energy. Here there is no identical being but there is an identity in process. It must not be understood that a consciousness is chopped up in bits and joined together like a train or a chain. But, on the contrary, "it persistently flows on like a river receiving from the tributary streams of sense constant accretions to its flood, and ever dispensing to the world without the thought-stuff it has gathered by the way. "12 It has birth for its source and death for its mouth. The rapidity of the flow is such that hardly is there any standard whereby it can be measured even approximately. However, it pleases the commentators to say that the time duration of one thought-moment is even less than one-billionth part of the time occupied by a flash of lightning. "The so-called being is like a flash of lightning that is resolved into a succession of sparks that follow upon one another with such rapidity that the human retina cannot perceive them separately, nor can the uninstructed conceive of such succession of separate sparks. "13 As the wheel of a cart rests on the ground at one point, so does the being live only for one thought-moment. It is always in the present, and is ever slipping into the irrevocable past. What we shall become is determined by this present thought-moment. Buddhism does not totally deny the existence of a personality in an empirical sense. It only attempts to show that it does not exist in an ultimate sense. The Buddhist philosophical term for an individual is Santana, i.e., a flux or a continuity. It includes the mental and physical elements as well. The Kammic force of each individual binds the elements together. This uninterrupted flux or continuity of psycho-physical phenomenon, which is conditioned by Kamma, and not limited only to the present life, but having its source in the beginningless past and its continuation in the future — is the Buddhist substitute for the permanent ego or the immortal soul of other religions. Nibbana is not situated in any place nor is it a sort of heaven where a transcendental ego resides. It is a state which is dependent upon this body itself. It is an attainment (Dhamma) which is within the reach of all. Nibbana is a supramundane state attainable even in this present life. Buddhism does not state that this ultimate goal could be reached only in a life beyond. Here lies the chief difference between the Buddhist conception of Nibbana and the non-Buddhist conception of an eternal heaven attainable only after death or a union with a God or Divine Essence in an after-life. When Nibbana is realized in this life with the body remaining, it is called Sopadisesa Nibbana-dhatu. When an arahant attains Parinibbana, after the dissolution of his body, without any remainder of physical existence it is called Anupadisesa Nibbana-dhatu. "If any teach Nirvana is to cease Say unto such they lie. If any teach Nirvana is to love Say unto such they err." Does the arahant exist or not after death? "The arahant who has been released from the five aggregates is deep, immeasurable like the mighty ocean. To say that he is reborn would not fit the case. To say that he is neither reborn nor not reborn would not fit the case." One cannot say that an arahant is reborn as all passions that condition rebirth are eradicated; nor can one say that the arahant is annihilated for there is nothing to annihilate. "The Buddha has given such answers when interrogated as to the conditions of man's self after death;14 but they are not familiar answers from the tradition of the 17th and 18th century science." Avihimsa — Harmlessness or compassion, which is opposed to cruelty and callousness. the endeavor to promote the good which has already arisen. "A den of strife is household life, And filled with toil and need; But free and high as the open sky Is the life the homeless lead." It should not be understood that everyone is expected to lead the life of a Bhikkhu or a celibate life to achieve one's goal. One's spiritual progress is expedited by being a Bhikkhu although as a lay follower one can become an arahant. After attaining the third state of Sainthood, one leads a life of celibacy. Securing a firm footing on the ground of morality, the progressing pilgrim then embarks upon the higher practice of Samadhi, the control and culture of the mind — the second stage on this Path. Samadhi — is the "one-pointedness of the mind." It is the concentration of the mind on one object to the entire exclusion of all irrelevant matter. Cultivation of the four sublime states — loving-kindness (Metta), compassion (Karuna), sympathetic joy (Mudita), and equanimity (Upekkha) — is highly commendable. After giving careful consideration to the subject for contemplation, he should choose the one most suited to his temperament. This being satisfactorily settled, he makes a persistent effort to focus his mind until he becomes so wholly absorbed and interested in it, that all other thoughts get ipso facto excluded from the mind. The five hindrances to progress — namely, sense-desire, hatred, sloth and torpor, restlessness and brooding and doubts are then temporarily inhibited. Eventually he gains ecstatic concentration and, to his indescribable joy, becomes enwrapt in Jhana, enjoying the calmness and serenity of a one-pointed mind. With his one-pointed mind which now resembles a polished mirror he looks at the world to get a correct view of life. Wherever he turns his eyes he sees nought but the Three Characteristics — Anicca (transiency), Dukkha (sorrow) and anatta (soul-lessness) standing out in bold relief. He comprehends that life is constantly changing and all conditioned things are transient. Neither in heaven nor on earth does he find any genuine happiness, for every form of pleasure is a prelude to pain. What is transient is therefore painful, and where change and sorrow prevail there cannot be a permanent immortal soul. Whereupon, of these three characteristics, he chooses one that appeals to him most and intently keeps on developing Insight in that particular direction until that glorious day comes to him when he would realize Nibbana for the first time in his life, having destroyed the three Fetters — self-illusion (Sakkaya-ditthi), doubts (Vicikiccha), indulgence in (wrongful) rites and ceremonies (Silabbataparamasa). At this stage he is called a Sotapanna (stream-winner) — one who has entered the stream that leads to Nibbana. As he has not eradicated all Fetters he is reborn seven times at the most. Summoning up fresh courage, as a result of this glimpse of Nibbana, the Pilgrim makes rapid progress and cultivating deeper Insight becomes a Sakadagami (onnce-returner) by weakening two more Fetters — namely Sense-desire (Kamaraga) and ill-will (Patigha). He is called a Sakadagami because he is reborn on earth only once in case he does not attain Arhatship. It is in the third state of Sainthood — Anagama (never-returner) that he completely discards the aforesaid two Fetters. Thereafter, he neither returns to this world nor does he seek birth in the celestial realms, since he has no more desire for sensual pleasures. After death he is reborn in the "Pure Abodes" (Suddhavasa) a congenial Brahma plane, till he attains Arhatship. Now the saintly pilgrim, encouraged by the unprecedented success of his endeavors, makes his final advance and, destroying the remaining Fetters — namely, lust after life in Realms of Forms (Ruparaga) and Formless Realms (Aruparaga), conceit (Mana), restlessness (Uddhacca), and ignorance (Avijja) — becomes a perfect Saint: an arahant, a Worthy One. "Goodwill and wisdom, mind by method trained, The highest conduct on good morals based, This maketh mortals pure, not rank or wealth." As T.H. Huxley states — "Buddhism is a system which knows no God in the Western sense, which denies a soul to man, which counts the belief in immortality a blunder, which refuses any efficacy to prayer and sacrifice, which bids men to look to nothing but their own efforts for salvation, which in its original purity knew nothing of vows of obedience and never sought the aid of the secular arm: yet spread over a considerable moiety of the world with marvelous rapidity — and is still the dominant creed of a large fraction of mankind." Now inhale through the nostrils normally, without strain, without force. Mentally count one. Exhale and count two. Inhale and count three. Count up to ten constantly concentrating on the breathing process without thinking of anything else. While doing so one's mind may wander. But one need not be discouraged. Gradually one may increase the number of series — say five series of ten. May I16 be well and happy! May I serve to be perfect! May I be perfect to serve! 1. An Awakened or Enlightened One. 2. Lit., Thus who hath come. 3. Literally, the Worthy Ones. They are the enlightened disciples who have destroyed all passions. 9. Culakamma Vibhanga Sutta — Majjhima Nikaya, No. 135. 10. See Many Mansions and The World Within by Gina Cerminara. 12. See Compendium of Philosophy, Trans. by Shwe Zan Aung (Pali Text Society, London) — Introduction p. 12. 13. Compare the cinematograph film where the individual photographs give rise to a notion of movement. 14. Evidently the writer is referring to the state of an arahant after death. 15. This introductory part may be omitted by non-Buddhists. 16. Here the term "I" is used in a conventional sense. Source: This work is in public domain. Please check the rules applicable to your country of residence before downloading the information.. While every attempt has been made to reproduce the text faithfully, we cannot guarantee the accuracy or the reliability of the original text.